I have observed considerable differences in people's ability or desire to focus and the frequency with which they tend to move from one object of focus to another. The chart below sums up my observations in a sort of typology. In reality, both dimensions form a continuum, and each person is capable -- to some degree -- of operating in each state. But many or most people will be able to identify a primary state or two that they tend to spend most of their time in. I presume one's childhood personality can provide clues to help identify one's main operating quadrant or at least one's location along the continuum. The chart below lists types of activities that correspond to different states of mind as well as broad personality traits. I think these traits are inborn, but it might be that childhood mental stimulation patterns (e.g. TV viewing, computer and video games, etc.) can permanently alter (shorten) one's attention span. Furthermore, people may go through periods (particularly their high school and college years) where they are more mentally focused, but then leave this state behind them after graduation. The chart might also help identify the necessary state of mind to develop for a particular type of activity that one wants or needs to do. For instance, effective book study requires a highly focuses, undistracted state of mind (quadrant II). Achieving this will be easier for someone of this type and harder for people of other types. One can improve one's chances of success by choosing a time of day and environment when one's mind tends to be sufficiently calm and distractions are minimal. Also, there are useful tricks such as underlining, highlighting, and outlining that can improve one's ability to absorb complex information. People who are typically calm and nonverbal may have problems getting to state I, which requires an active mind and mouth and quick reactions. Likewise people from quadrant I may find the idea of slow, repetitious activities almost unbearable, while people of type II may find them enjoyable and relaxing as compensatory activities. 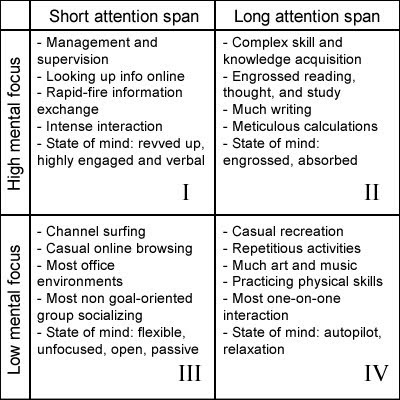 People in quadrant III may have a hard time building up the energy and concentration to engage in the solitary, focused activities of quadrant II, and people of type II often feel lost when in a type III environment. In general, it seems that people move fairly easily between adjacent quadrants (i.e. from I to II or from I to III) but have difficulty engaging in activities from diagonal quadrants (i.e. IV from I). Again, both dimensions are continuous, so this pattern is most obvious for people at the extremes. My next observation is that this typology is only loosely related to socionic types. For instance, among ILEs and IEEs types I and II are both common. Differences in attention span between people of the same socionic type can be especially drastic. One ILE manager and entrepreneur confesses to "never reading any books" while another spends many hours a week engrossed in personal study. The first speaks rapidly, is constantly communicating with other people formally and informally, answers dozens of e-mails a day (sending short, carelessly formulated replies), browses the Internet several hours a day, and spends little time alone. The second speaks more slowly and deliberately, spends many hours a day alone studying and writing, is meticulous and analytical, and spends only a few hours a day with other people, mostly choosing companions who share one or more of his interests. I think what I am calling "short and long attention span" basically corresponds to what modern psychology terms "extroversion and introversion." As a type II person, I enjoy my type IV compensatory activities and my occasional forays into type I, but type III people are as if from another planet. When I find myself "wasting time" on casual unfocused activities that are the norm for many other people, I feel disoriented, often disheartened, and need time to recover and get back into my usual groove. I imagine the same would be true for them in a type II environment. One way I have created a better environment for my mostly type II life is by eliminating TV and Internet at home -- two instruments that break down one's attention span and ability to engage in productive activities for extended periods of time. My type I acquaintances don't understand my decision because they aren't so easily disoriented by high levels of stimulation. An interesting consequence of this typology is that people of relatively incompatible types can end up in the same quadrant. Quadrant II, for instance, can include both IEEs and LSIs, IEIs and LSEs. Quadrant I often has SEEs along with ILEs and ESEs along with LIEs. The solitary, meticulous work of accountants requires focus and attention just like the solitary research of an academic, even though the two activities are very different and two people of these professions might not get along. Type II can include both rigid and liberal individuals. There is probably a tendency for more women to be in quadrants III and IV and more men to be in I and II. Author John Gray has written extensively about women's more open and receptive consciousness and men's greater focus, while recognizing that some women possess more "masculine" qualities and vice versa. In traditional cultures it is commen for women to get together to engage in light repetitive handwork (weaving, knitting, etc.) while engaging in conversation and social bonding. This would correspond to quadrant IV or III depending on whether more emphasis is on the physical activity or on socializing. Of course, if some guys get together for jogs through the park, that is also quadrant IV. Among the specialists of quadrant II males clearly predominate. Here you find people whose main purpose in life appears to be skill acquisition or knowledge production. Women can also be found in quadrant II, but their biological program requires them to be capable of letting go of personal pursuits for a while and be receptive to the needs of their dependent offspring. It should be noted, however, that the degree of gender differences varies from culture to culture, with masculine cultures (Japan, Austria, Italy, Switzerland, Mexico, U.K., USA) exhibiting greater gender differences than feminine ones (Scandinavia, Chile, Portugal, Thailand, Guatemala, etc. ), according to researcher Geert Hofstede (who unfortunately left many countries out of his analysis, particularly the Soviet bloc and the Arab world). Some readers may note similarities between my quadrants and the time management matrix of Stephen Covey (i.e. urgent vs. non-urgent and important vs. unimportant activities). I also noticed this, but I don't think the two systems have that much in common. You're right, I did spot the similarity at once to the 7 habits time-management matrix. While I personally agree with what you said to the effect that the similarity is only superficial, I can easily see how many people might view Quadrant I and II activities as being more 'important', and perceiving people who tilt more to these two sides as being more 'productive' people, so that the unconscious mental associations thus made are essentially same as for the time management matrix. Of course, I'm only talking about the first impressions that many people form (often those who haven't even heard of these things), as opposed to studying these systems and making conscious correlations. One other small thing, if it isn't too much of a bother - if you could change the colour of your highlighted comments/observations in your other posts from red to a less eye-straining colour like blue or something, I'd be much obliged. You see, I sometimes like to browse through your earlier posts when seeking clarification on some points, and this one thing tends to really hit me in the face and distract me (and also leave the eyes strained). I had trouble locating a feedback section if there's any, so I decided to post this here. You say you notice a relationship between attention span and psychological extroversion and introversion, but typically extroversion is explained in terms of social directedness. As such, I think it actually correlates more to your dimension of mental focus, and attention span perhaps relates more to the concept of conscientiousness.